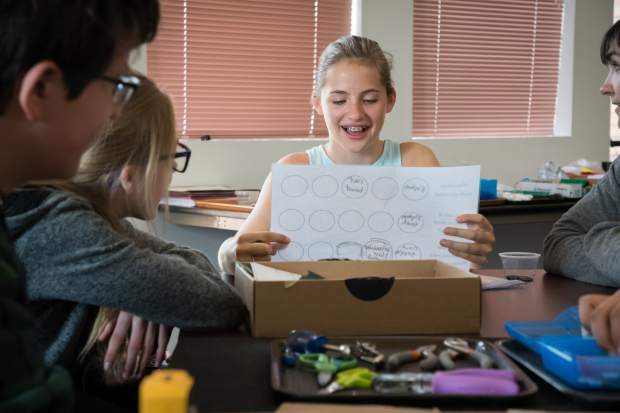 Riverview School eighth grader Emma Price goes over ideas with her group at the Design, Thinking, Tools and Technology teacher training workshop in Carbondale. A two-day teacher tutorial held at Carbondale Town Hall on Thursday and Friday presented educators and students in fourth through eighth grade typical subjects like math and science in a not so typical, technological way. Teachers and students from across the Roaring Fork School District participated in the Engineering the Future: Tools and Technologies for Classroom Innovation STEM workshop. The goal of the program is to give teachers a chance to engage with students as they train. Ben Bohmfalk is technology integration facilitator for Roaring Fork Schools. “My role is primarily about helping all content areas and all grade levels integrate technology into their instruction to increase student engagement, and this is just a really good example of high engagement, cross-curricular activities,” he said. Presented by Eric Carpenter and Scott Sieke from University of Colorado’s Science Discovery, the different 75-minute learning modules included thermo chromic liquid crystal globes, as well as numerous Edison educational robots. Exercises utilized the 21st century tools, and students who participated learned about relationships in the Earth system, computer programming, and more. Sieke explained how he does not find teacher professional development workshops as effective when a presenter simply speaks with teachers in front of a PowerPoint presentation. Instead, he prefers engaging with both students and teachers simultaneously as it grants educators a unique opportunity. Many teachers in attendance, including Glenwood Springs Elementary School’s Jeremy Heiser, echoed Sieke’s philosophy. “When you are sitting side by side with a student who is struggling with something, and you are not trying to solve the issue for them but trying to simply facilitate their problem-solving skills and you are watching and interacting with their mindset, it really promotes my understanding of where they are. “When I am in a classroom with 25 students, I don’t necessarily get that one-on-one,” explained Heiser. In fact, although students greatly outnumbered teachers at the two-day workshop, Bohmfalk emphasized how the workshop actually focuses more on the educators in attendance. Particularly, what new technologies they can introduce in their classrooms. “Really, the goal of this is not as much about the kids who are here, it’s actually about the teachers taking this stuff and integrating it into their existing classes to meet their current standards,” Bohmfalk said. Roaring Fork Valley teachers looked on as CU’s Discovery Science instructors Carpenter and Sieke enthusiastically taught their students what sounded like college-level classes — Hybrid Learning in Earth and Space Science, Body Systems and Mechanics Makerspace, and Meet Edison: Standards-Based Robotics. While any Roaring Fork School teacher could attend the workshop, obviously only a select number of students could participate. Heiser chose to bring some of his under-privileged students along. Judging by their interactions, they loved it. After all, they built Legos on top of robots and then commanded them with directions. The honest 10-year-old student said he still prefers a school setting over a workshop. However, luckily for Oswaldo, he certainly will see more technology gadgets and Legos in his classroom in the future, as every teacher in attendance left with an Edison robot. The Design Thinking Tools and Technology STEM Workshop concluded on Friday.